Here you'll find all the files, resources and videos to accompany issue 230 of 3D World magazine. To download the accompanying files for 3D World issue 230, simply click the link below each article and a zip file will automatically download the content to your Mac or PC. If you've missed this issue or other editions of 3D World, order a copy. 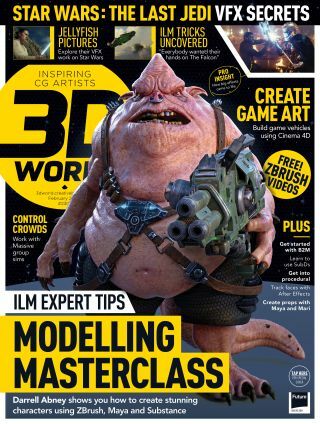 Darrell Abney, of ILM, teaches you how to create his incredible cover image, from planning and modelling, though to sculpting, materials and setting up the render. In this tutorial you will learn how to create CG for advertising, including setups, UV layouts and so much more. This training is useful for many areas, not just ads, so definitely worth reading, no matter which field you are in. In this tutorial Jessica Soderstrom teaches you how to take a real world prop and model a digital asset from it, for use in your CG or compositing projects. Here you will find all the files need for our regular Q and A section including a great section on creating Vector Displacement Maps in Zbrush.